Once a new product launch, project, program or organization is found to be de-railed, a systematic approach to analyzing, deciding and implementing a tactical turnaround is required. I have used the D.R.I.V.E. 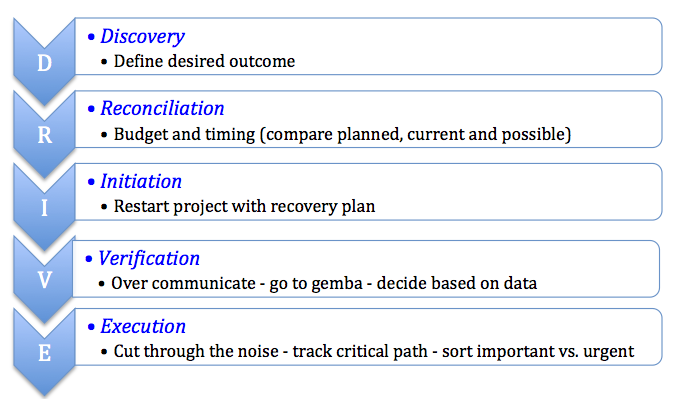 approach, outlined below, for new product launch, project, program and organizational turnarounds. 1) Discovery: Define the desired outcome. Remember, this is a turnaround and the team has lost the critical path and the objective. They are letting the project happen to them. So, when I am assigned to a crisis project, the first step is to find the critical path and learn the objective. 2) Reconciliation: This is related to budget and timing. I always set out to compare planned, current status and possible (new plan) for budget and timing and report out to the stakeholders as I get set to re-start the project. I won't promise success by the original metrics unless I can establish a credible plan to do so. This is when I determine the timing that is possible, assess for compression and consider expediting. 3) Initiation: This is a re-start of the program with the new credible plan. Even though it sounds illogical for "initiation" to be the 3rd step, you can't restart unless you learn the objectives and have a credible plan. Otherwise, I would be in the same situation as the team that was previously engaged ("READY, FIRE!, AIM!). The team needs an obvious restart with clear direction. Again, this is for a project turnaround. 4) Verification: This is just my reminder to not let go of the reigns. Do not assume "no news is good news". The devil is in the details and I feel that I need to verify status and progress at a very detailed level during the initial stages of a turnaround. In reality, it is happening concurrently with execution of the plan. However, many PM's that I have seen simply display the plan and then go wait at the finish line for the team to arrive. So, "verify" is simply to indicate a way of life for a properly paranoid program manager. Go to gemba. 5) Execution: This is simply performing the steps in the plan. The PM's job in this is to keep the team focused on the critical path and not take the bait to focus on one facet of the program at the expense of the critical path. Execution is not a natural phenomenon. It takes considerable focus. You've heard of the boiling frog analogy to a team that is slowly losing control? Frogs get put in a pot of cool water and the heat is turned on. It starts to warm up and the frogs are loving it. It continues to get hot until it starts to boil. By the time the frogs realize there is a crisis it's too late: they're cooked. When a turnaround is required, my job is to be an "Ice Frog". I get dropped into the boiling pot, cool the water, stop the boiling and save the frogs.